For those readers who may be unfamiliar or only partly acquainted with the life, work, and vitally important role of Mr Judge, we advise the reading of the articles The Welcome Influence of William Q. Judge and Who was William Quan Judge? before going any further. It will be difficult for the remainder of this article to be properly appreciated and grasped in its significance unless the information presented in those two has already been absorbed. 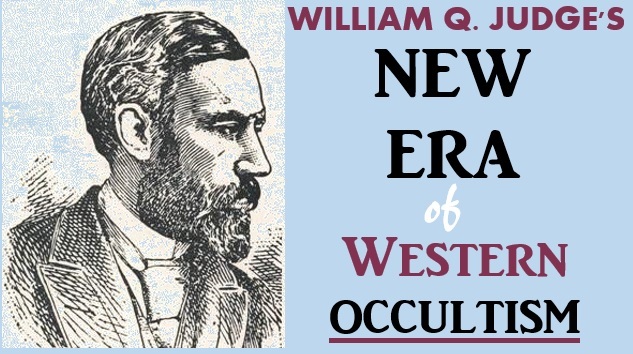 In retrospect, his use of the term “Western Occultism” in this context seems to have been an unfortunate choice, as to the vast majority of people “Western Occultism” can mean anything from the esoteric system and philosophies of the Hermetic tradition to Rosicrucianism to Gnostic Christianity to Freemasonry to Alchemy to Platonism or Neo-Platonism to the Kabbalah and beyond. In other words, almost anything except the Eastern esotericism which defines Theosophy and the Theosophical Movement. But this is not what he meant, as can be seen from the passages which follow. As he writes, “This does not mean that the Western Occultism is to be something wholly different from and opposed to what so many know, or think they know, as Eastern Occultism.” He did not for one moment propose or suggest any alteration or dilution of the profoundly Eastern themed teachings of HPB and her Adept Teachers, often known as the Masters, nor did he attempt to introduce any “new” teachings of his own, but always remained faithful and true to the Message and Messenger of the Masters. These remarks by Mr Judge largely came about as a necessary reaction to the ideas and activities being engaged in at that time by Annie Besant, who had fallen under the influence of an Orthodox Hindu Brahmin named G.N. Chakravarti, been officially received into the fold of orthodox Hinduism on a visit to India, begun to criticise and belittle HPB on a frequent basis, and started to distort and even suppress and reject HPB’s teachings in favour of the new and quite different teachings she was receiving from Chakravarti and his friends. Under Chakravarti’s influence, the India and Indians of the present day were held aloft by Besant as being virtually perfect, divine, supremely spiritual, and to be looked up to and emulated by all. As well as starting to dress like an Indian, often being seen in a sari, she began adopting various Hindu customs and rituals, and encouraged other Theosophists to do the same. Seeing the madness and danger in all this, Mr Judge felt compelled to speak out, only to be met by Besant and Chakravarti with accusations of not properly understanding and appreciating the East and trying to cause disharmony and conflict within the Theosophical Movement. “It seems rather imprudent and lacking in discrimination that many Theosophists – even some who are devoted students of the original teachings of HPB, WQJ, and the Masters – are sometimes eager to closely associate themselves with some of the many Hindu Gurus and Yogis that come to the West or to seek teachings and important advice from Buddhist monks, whether Mahayana or Theravada. “All of these people only promote exoteric and orthodox teachings. Their fundamental doctrines and views are in many cases entirely contradictory and incompatible with those of Theosophy. Theosophists can learn but little from such people and may even risk being dragged back into exotericism, literalism, and even anthropomorphism and idolatry, not to mention the possibility of being manipulated and conned by some of the less savoury amongst their ranks, as has happened to many. William Judge was attempting to warn the West against “the swami craze” as far back as the 1890s but his sage advice has apparently gone unheeded. Those who are not students of Theosophy cannot be blamed for becoming followers or devotees of various Indian and other Eastern teachers and religions. In most cases they have never even heard of Theosophy or, if they have, they have only come across the later and extremely distorted and altered versions of it, such as the teachings promulgated by the likes of C.W. Leadbeater and Alice Bailey, which they understandably find unappealing and rather suspect in nature. Mr Judge was always the first to agree with the old adage that “The Light comes from the East” but as we see here, he was eager to point out that the Light – i.e. the Light of spiritual Truth and genuine Knowledge and understanding – is not shining from the modern East. It shines from what we could call the mystic East, the ideal East, the esoteric East, the inner East, and not from today’s India or today’s anywhere. The vast majority of today’s Indians will readily admit that their great nation is sinking increasingly and seemingly hopelessly into deeper and deeper materialism and moral darkness and degradation, whilst the majority of the Hindu priests and religious teachers continue to hold the sincere and unsuspecting devotees in ignorance, superstition, and ritualistic idolatry. It is a matter of simple fact that many Theosophists – we mean those who are real students of HPB – understand, appreciate, love, and have better knowledge of the scriptures and religious philosophies of ancient India than many modern day Indians, even some of the most devout Hindus. But to also help the world, to help humanity at large, has always been the chief aim and intention of the Theosophical Movement. For many decades now, Westerners have been introduced and exposed at large to Hatha Yoga, Kriya Yoga, Kundalini Yoga, worship of anthropomorphic Hindu deities, singing and chanting of Sanskrit mantras, ancient rituals, and a whole load of self-proclaimed “Enlightened Teachers” from India. Is the West any better for it? Has the world been bettered by it? A relatively small number of people have been truly and lastingly helped and benefited by it but many have experienced all sorts of troubles and problems – physical, psychological, spiritual, and otherwise – from getting involved with these types of things which should not be recommended to anyone, least of all to unprepared and naïve Westerners who have no grounding in proper Eastern philosophy and cannot perceive the frequent dangers inherent in such practices and teachings. And the world at large has continued unabated its downward march towards spiritual suicide and self-destruction. Theosophy, although Eastern in nature and style, is specifically suited for the Western world; perfectly safe and purely beneficent. It is the “Western Occultism” spoken of by William Q. Judge and, once it is known and its true nature and teachings understood, the “New Era” he foresaw may finally begin to dawn without hindrance or obstacle. In so doing, much lasting help and benefit will be conferred upon both the West and the East. “The Theosophical movement was begun as a work of the Brotherhood of which H.P.B. is a member, and in which the great Initiate, who was by her called Master, is one of the Chiefs. “The fact is significant that the Theosophical movement was thus, as said, begun in the Western world, in the country where the preparations for the new root race are going on, and where that new root is to appear. This was not to give precedence to any one race or country over another, or to reduce any race or country, but was and is according to the law of cycles, which is a part of evolution. In the eye of that great Law no country is first or last, new or old, high or low, but each at the right time is appropriate for whatever the work is that must be performed. Each country is bound up with all the others and must assist them. “This movement has, among others, an object which should be borne in mind. It is the union of the West with the East, the revival in the East of those greatnesses which once were hers, the development in the West of that Occultism which is appropriate for it, so that it may, in its turn, hold out a helping hand to those of older blood who may have become fixed in one idea, or degraded in spirituality. “It is not the desire of the Brotherhood that those members of the Theosophical movement who have, under their rights, taken up a belief in the messengers and the message should become pilgrims to India. To arouse that thought was not the work nor the wish of H.P.B. Nor is it the desire of the Lodge to have members think that Eastern methods are to be followed, Eastern habits adopted, or the present East made the model or the goal. The West has its own work and its duty, its own life and development. Those it should perform, aspire to and follow, and not try to run to other fields where the duties of other men are to be performed. If the task of raising the spirituality of India, now degraded and almost suffocated, were easy, and if thus easily raised it could shine into and enlighten the whole world of the West, then, indeed, were the time wasted in beginning in the West, when a shorter and quicker way existed in the older land. But in fact it is more difficult to make an entry into the hearts and minds of people who, through much lapse of time in fixed metaphysical dogmatism, have built in the psychic and psycho-mental planes a hard impervious shell around themselves, than it is to make that entry with Westerners who, although they may be meat eaters, yet have no fixed opinions deep laid in a foundation of mysticism and buttressed with a pride inherited from the past. “He finds the magnetism of his countrymen too stifling to be borne; asserts that India is spiritually degraded; hints that her destiny is to go out “in the engulfing blackness of ruin,” unless she is raised up, which would arouse a doubt as to her ability to uplift any other nation. It also explains why she has not, for so many centuries, done anything to help other countries. He says the Hindus are getting materialistic – referring to those who take English education – and ends by declaring himself a follower of his Patron, Buddha. The Letter to some Brahmins, published in The Path, enforces the point about Buddhism, and also shows how dense is the surrounding aura of those Brahmins who are strictly orthodox, and how much easier it is for the Adepts to affect the Westerners than the Hindus. And if the wall around the educated Brahmin is impenetrable, how much more so is that surrounding the mass of ignorant, superstitious people who take their religion from the Brahmin! The spiritual degradation of India to which the Master referred is an indisputable fact. The great majority of Brahmins are theologically and metaphysically as fixed and dogmatic as the Romish Church; they also keep up idol-worship and a great number of degrading caste observances. The poor, uneducated, common people, forming the core of the Hindu population, are gentle, it is true, but they are ignorant and superstitious. Their superstitions are theological; the Brahmin fosters this. The other class, consisting of those who take up English, have lost faith and are, as the Masters wrote, materialized. “The Theosophical movement was founded and flourishes in the West pre-eminently and under Western influence. It began in America, farthest West, started there by the Masters. A very pertinent question here is, why it was not begun in India if that country is the one of all we are to look to? Very evidently the beginning was made so far West because, as so often stated by H.P.B., the next new race is to appear in the Americas, where already preparations in nature for the event are going on. This means that the center, the top, the force of the cyclic wave of evolution is in the West – including Europe and America – and all the observable facts support the contention. “Now in the face of all these facts, and of many more which could be brought forward, where is the brotherliness, the Theosophy, the truth in starting against me a charge that I wish or try to set the East and West against each other? If in India are initiates – which H.P.B. often denied, if there is the highest spiritual wisdom, why so many Hindus trying to reform it; why so many Hindus at the feet of H.P.B. asking for truth and how to find the Master; why so many Hindus in the E.S.T. for the purpose of getting teaching from Westerners? The answers are easy. Let those who are not carried away by a mere name, who can calmly examine facts, see that the West is the advancing conqueror of human destiny; that the Eastern lands, both India and other places, are storehouses for the world, holding from the past treasures that the West alone can make avail of and teach the East how to use. Let sectional jealousy cease, and let us all be careful that we do not inject into the mental sphere of the Theosophical Society any ideas, arising from sentiment or from insufficient reflection, which might become a hindrance, however slight, to the evolutionary impulse, or which might tend concretely to limit the expansion of the great work begun by H.P.B. To create such a hindrance is an act, the gravity of which, though it may be not appreciated, is nevertheless very great. “Doubtless India is now the most ancient storehouse of Aryan philosophy which may be called theosophical … Beyond question also, the Hindus of today have more metaphysical acumen than we have. But the West is creeping up. And intellectual, metaphysical gifts are not spiritual gifts. We have all the intellect we need, active and latent. The Hindu of today is a talker, a hair-splitter, and when he has not been altered by contact with Western culture he is superstitious. Such we do not want as teachers. We will hail them as brothers and co-workers but not as our Magisters. But those Hindus who come here are not teachers. They have come here for some personal purpose and they teach no more nor better than is found in our own theosophical literature: their yoga is but half or quarter yoga, because if they knew it they would not teach a barbarian Westerner. What little yoga they teach is to be read at large in our books and translations. In light of the lasting damage and destruction brought upon the Adyar Theosophical Society after HPB’s passing, through Chakravarti and the Brahmin influence which Annie Besant so misguidedly welcomed with open arms (see Col. Olcott’s Disloyalty to H.P. Blavatsky for further details and important explanation), these further words of HPB are very significant. If only they had been heeded! Just three weeks before she passed away in 1891, H.P. Blavatsky said to the Theosophists, “In your hands, brothers, is placed in trust the welfare of the coming century; and great as is the trust, so great is also the responsibility.” (See “Five Messages from H.P. Blavatsky to the American Theosophists”) If we failed to do the job properly in the 20th century, there is still time to do it in the 21st. SOME RELATED ARTICLES: Who was William Quan Judge?, The Welcome Influence of William Q. Judge, The Final Mahatma Letter, Gandhi on Blavatsky and Theosophy, Col. Olcott’s Disloyalty to H.P. Blavatsky, Our Mother India, To those Theosophists who distrust “The Mahatma Letters”, The Masters and Madame Blavatsky, Words from The Masters about H.P. Blavatsky, Praise for H.P. Blavatsky and Theosophy, Responding to Lies about H.P. Blavatsky, What do we mean by Occult?, Damodar and the Hall of Initiation, Maji – The Yogini of Benares, Higher Kundalini and Lower Kundalini, 12 Things Theosophy Teaches, Theosophy: The Ancient Wisdom, The Closing Cycle, and Unity of the World’s Religions. The words “East – West” as used by most people so politicized, charged with values and emotions that a person with some degree of( spiritual ) self reflection will see in his use the black magic [ as properly defined in one of your article in this site]. But when one found the same vocable in esoteric literature [in this instance thesophy- used with the same emotional and value contents, it raises suspicion of certain provincialism, or cultural/national pride. In the excerpts aforementioned , the tone and content of the sentences remind me of an ex toric discourse that emphasize the ” white man [ Western] burden”. We are all aware of the suffering caused by this messianic view. As much as i admired the depth and the apparent accuracy of the Theosophical philosophy, I have hard time to refrain the growing feeling that some of the its Messengers may have infected the Message with their prejudices. Hello Fabrice, could you perhaps specify more exactly which statements or ideas you considered to be prejudiced or inappropriate or offensive in this article? I can assure you that William Judge was by no means emphasising supremacy, superiority, or greater importance, of any nation, culture, or race, over any other. Theosophy teaches that the newest and youngest race-group to have been evolved is the so-called “white” race in the West and also that the next major evolutionary cycle on this Earth is to have its origins in America because the intermixing there of so many different races, nationalities, and cultures, will give birth in due time to a new and ideally more advanced expression of human organism and type. But this does not mean that these places or nationalities are in any sense superior to others. On the contrary, they may be viewed from one perspective as being some of the least advanced in the world, due to their being so young in comparison with other, much older, and often much wiser, races and nations. The concept of a “New Era of Western Occultism” is simply that at the present time the newly evolving West needs an Occultism, a Philosophy, a system of esoteric study and development, which will be properly suited for it and which will help rather than hinder it in the correct and safe inner unfoldment of those souls who happen to be incarnated in the West. Theosophy is of course just as much for the East as for the West as for anywhere and anyone else. Mr Judge’s main point here, as far as I understand it, is that it is Theosophy that the West needs, and not any exoteric Eastern practices and teachings from Hindu Gurus, Yogis, and Swamis, or Buddhist monks and Lamas. If the latter were what was needed or were sufficient, the Masters of the Trans-Himalayan Brotherhood would not have bothered doing the great work They did through H.P. Blavatsky. It is not “the modern East with its Yogis and Fakirs, its hide-bound castes, its subtle and magnificently intellectual theology, its Hatha Yoga and all the dangers attending that” to which our thoughts and attention should be turned…not, at any rate, if we happen to believe that the Masters of Wisdom know best. I hope that this may have clarified some of the points for you. Please feel free to comment further if you would like to.